Dogs and cats are wiser than we are. They remain in touch with their instincts, whereas we, with our higher intelligence and sophisticated education, have never been so out of touch with ours. Animals and even plants are very sensitive to earth energies. The energy emanating from the earth’s molten core resonates at 7.83 hertz, as does the human brain when we are relaxed or in meditation. When we get stressed or angry, that resonance changes, and we are immediately out of sync with our environment. This oscillation is so important to our wellbeing, NASA had to reproduce it artificially in spacecraft because their astronauts became quite ill without it. The earth’s resonance changes in places, affected by something as apparently innocent as an underground stream, mineral deposits or other natural phenomena. This will mean parts of our host planet are out of harmony with us. Such negative energy is referred to as geopathic stress, which can disrupt the harmonic sequence and affect not just the human body but our auras as well, where most illnesses begin. Energy spirals and ley lines can affect us too, as well as the oscillations from many of our electronic devices today, particularly mobile phones. Dogs don’t like geopathic stress and will avoid such areas. If a dog’s bed is inadvertently placed on or near negative earth energy, the dog will become ill. Whereas cats positively seek it out, revel in it, and will return to a favourite spot time and again. Having got us really worried, our speaker Jon Martin on Saturday 22nd January asked for a volunteer to demonstrate this effect. We’ve known for sometime that there is a geopathic stress line running through Slimbridge Village Hall, so Jon chose someone who happened to have been sitting in it - in the front row! Jon then did some muscle testing (kinesiology) and found the muscles had certainly been affected. Another volunteer dowsed his aura, found to be a mere 1.5 metres. Speaker Jon Martin (centre) watches as Peter Golding (right) dowses the size of the aura of a volunteer. Standing well away from the stress line, Jon then sought to heal the aura of the brave volunteer, taking a few moments to send healing with intent. 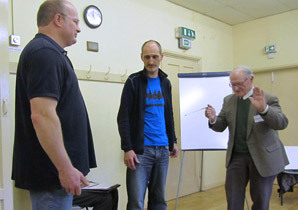 His aura was then dowsed again and had increased to 2 metres, and the volunteer agreed he did feel significantly better. Asked how he sent such healing, Jon replied that he concentrated on the same meridians running through the body that are accessed and treated by acupuncturists, which has been proved to work. Then he simply sends good energy with the intent to heal. Prevention is always better than cure, and many cultures solve the problem by not building over areas of geopathic stress. The Chinese orientate buildings to avoid it, the Aborigines refer to it as song lines, the Irish have their fairy lines, they all respect such phenomena but we Brits refuse to believe any of it and build all over it! Clues as to whether you have geopathic stress in your garden or home can be found by observing where the cat has a favourite spot, where the dog refuses to go or even by observing plants in the garden, where some will grow bigger than others.